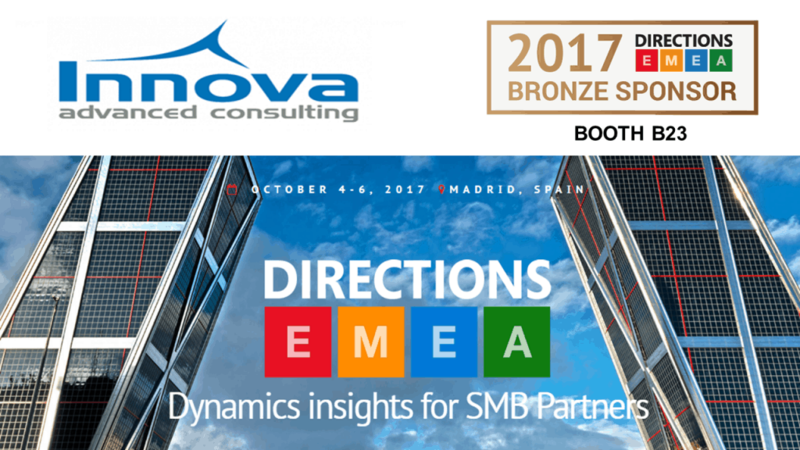 Innova Advanced Consulting will attend to Directions EMEA 2017 which will be held in Madrid, on the 4th – 6th October. Directions EMEA is widely known as the major event for Microsoft Dynamics NAV partners in Europe, having more than 1000 attendees in the last editions. Innova Advanced Consulting will take this unprecedented chance to experience this event in Madrid and not only will attend but also will do it as Bronze Sponsor. Therefore, Innova will be having a booth in the Expo (Booth B23) where meetings and presentations will be able to happen in a comfortable environment. The goal is to carry out as many meetings and conversations with partners from all the EMEA area and maximise the number of business opportunities. Visit us at BOOTH B23! Thank you for commenting on our post. Remember that all comments are moderated according to our comment policy.